Female goats, or does, can contract mastitis in the udders or mammary glands, which may start with no visible symptoms but quickly turn to acute mastitis as it progresses. Inflammation, swelling and pain increase as bacteria works into the mammary gland, resulting in a goat who becomes angry when she is milked or a doe who will not feed her young. If you suspect mastitis in your goat, contact your veterinarian. A goat with acute mastitis suddenly will have hard, swollen mammary glands and redness around the affected teat or teats. The infected area is hot and sensitive when touched and can result in the doe moving away from you or trying to kick you. The doe's milk is either watery, thin and yellowish in color or it flakes and clots quickly when a few drops are extracted. She may have a temperatures of 105 degrees or higher accompanied with an elevated pulse rate. A normal temperature range is 102 to 103 degrees plus or minus a half-degree. Temperatures above 103 degrees indicate an infection. Does who refuse to eat, act lethargic and show signs of depression or have offspring who are not thriving, may have this inflammatory disease. Dams often will not allow the offspring to nurse as they should because of the pain in the teats. If you have a nursing baby goat, you probably will need to bottle-feed her based on the direction of your veterinarian. Several things can cause mastitis in goats including bruised mammary tissues from a trauma or nursing. Some baby goats are quite rough when they nurse. Fly bites or other wounds in the general area of the teats can become infected allowing bacteria to travel into the mammary glands from poor hygiene. The most common bacteria at fault is caprine arthritis-encephalitis virus. Your veterinarian can make a diagnosis based on a microbiologic milk culture, and possibly a somatic cell count. The California mastitis test is most often used in the microbiologic milk culture to detect a high concentration in somatic cells to diagnose the seriousness of mastitis and determine treatment. Based on the test results, an intramammary infusion may be used in the affected gland along with drying off. Drying off refers to not milking the affected gland so milk production will cease, allowing the infusions to work better. Antibiotics and corticosteroids are often part of the treatment as well as glucocorticoids, which are an anti-inflammatory to reduce pain and swelling. Employing proper milking processes and keeping your goat's area clean can prevent mastitis. Inserting the teats into an aseptic solution and drying them before and after milking helps to prevent infections. 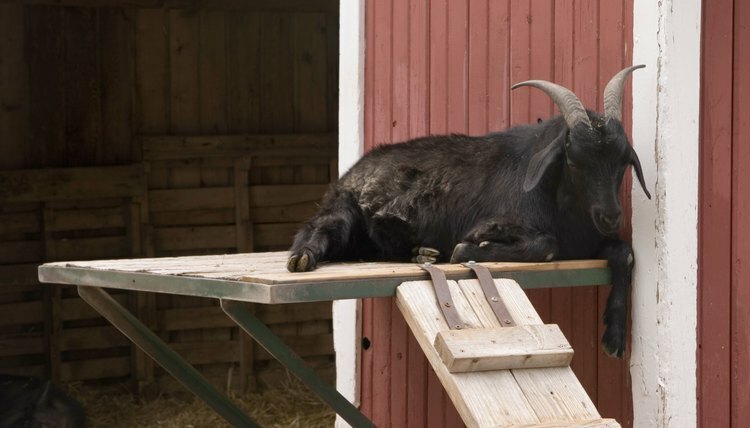 Keep goat pens dry and change the bedding daily to prevent foot rot from muddy conditions that can lead to mastitis through a fungal or bacterial infection. Minimize stress on your goat and consider having the horns trimmed, if you have more than one, to avoid accidents that cause trauma to the mammary glands, infections and mastitis. A clean, dry environment leads to a stress free goat with a proper immune system.